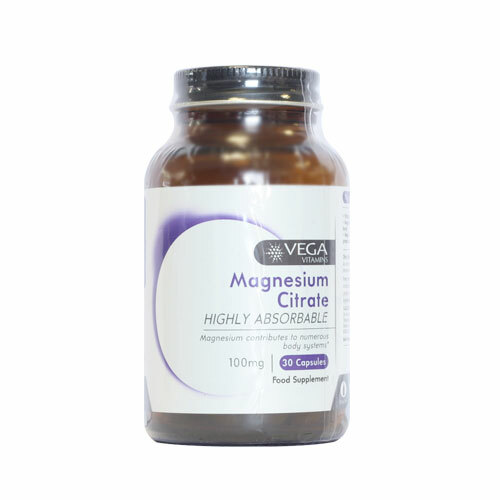 Vega Vitamins Magnesium Citrate is a supplement that may help energy production, bone development, growth, proper nerve transmission, muscle contraction and cardiovascular function. Magnesium is involved in over 300 different enzymatic and metabolic processes. Founded in extracellular fluids and in soft tissues, particularly in the muscle tissues. 50% of magnesium in the body is found associated within bone matter and therefore heavy drinkers, the elderly, diabetics, those with gastro-intestinal disorders, menstruating and menopausal women, and those who use oral contraceptives or diuretics may have an increased dietary requirement for magnesium. Magnesium Citrate, Vegetable Capsule Shell (Hydroxypropyl Methylcellulose, Colours (Titanium Dioxide, Copper Chlorophyllin)), Anti-caking Agent (Silicon Dioxide, Magnesium Stearate). Adults: Take 1-2 capsules daily with food or as directed by your healthcare practitioner.. If you are pregnant, consult your doctor before use. Below are reviews of Vega Vitamins Magnesium Citrate - 30 x 100mg Capsules by bodykind customers. If you have tried this product we'd love to hear what you think so please leave a review.